“Food is the ultimate joy of life”. Now, how many of you are a huge believer in this statement? Well, I can tell with all certainty that many of us are. Among the many pleasures offered by life, one is definitely a sumptuous meal. People work day and night to be able to afford many necessities and luxuries, and food is one of them. Be it at a usual food stall, food market, restaurant, high-profile eating places, we just all love heading there, isn’t it? But seriously can anything beat that experience of enjoying your favorite meals sitting in the comfort of your home, chilling alone or with family & friends, or watching Netflix or reading a book? Like, heading out and eating is fun occasionally, but that can’t be done every day. And this is the reason behind the humongous prominence of food ordering and delivery mobile apps. These cool mobile solutions allow people to easily place orders for their favorite food from their favorite restaurant simply at their fingertips. Life doesn’t get any better, does it? Food delivery apps are simply everywhere. Though they started off from the big cities, today these apps have even reached small towns & cities, and are offering food delivery services there as well. Among the many known food ordering apps out there, Deliveroo, UberEats, Postmates, GrubHub, FoodPanda, Zomato, happen to be the most prominent names. In fact, these mobile apps have a permanent spot in the mobile phones of most smartphone users. Today the millennials are deviated towards bringing the dining out into dining in setup, where they like their food to come to them, rather than, they go out for it. Now the restaurants and eateries are obviously more than eager to cash into this phenomenon and tying up with the apps and firms that offer a wide range of eateries, restaurants, cuisines, & payment options to make the order placements a lot easier for the foodies. Quite literally these apps and services have that potential to change the face of food ordering & delivery industry, and hence all businesses and start-ups that are entering in the food industry need a mobile app more than they need a website. So if you are a business that is looking to make a mark in the food delivery industry, then right now no option is better than getting a mobile app developed. In order to further learn how these food deliveries, mobile apps help in growing your business and to understand the process of creating one for your business, continue reading. If the research is anything to go by, this transition of the food business from offline to now online is a huge and today it is a worldwide trend. Statistics reveal that in the year in 2017, the most used food delivery services in the United Stated were UberEats, Eat24/Yelp, Amazon Restaurants, Postmates, DoorDash, Caviar, OrderUp, GrubHub & Delivery.com. Needless to say, there are numerous benefits of these apps-aggregators – for both the food consumers as well as the suppliers. In fact, the forecast reveals that with each year, the entire revenue of the food tech market is only going to grow. With the advent of countless tools & technologies, creating mobile apps has become a lot easier. However, as per the kind of app you want to create for your business, there are certain guidelines that you require to follow. So, here let’s explore them. Hence, it is clear that these platforms have a great choice for finding the right target audience/market for their apps. Competitors Analysis: The competition in this arena of food delivery is immense, and if you don’t want to fall in the list of failures, then competitors’ analysis is a must prior to your app launch. You can base your research about the competition platforms according to services, location, customers, profit & loss, and success stories & failures. Then, as per this data you can then provide desired and unique solutions that meet the goals & needs of the users. This way, it gets easier to count on market leadership. Ensure effortless cooperation: So, eventually the one thing that ensures the success of the food delivery platforms is trusted & smooth cooperation between the business & restaurants, local farming, or the food vendors. Your choice of future partners would depend on your business model. Like, in case of GrubHub, which is an intermediary firm, it works in partnership with the restaurants, where the restaurants are paying the commission fee for the orders, customers – for delivering. Resultantly, the partners are receiving more orders and get publicity as well, whereas a delivery app garners a rapid increase in the user flow. This way, the strong relationship and smooth cooperation with the partners, allow the firm to attain success in this arena. Drivers Network: As the orders are being delivered, they must reach the foodies in a faster possible way and must be piping hot, as they don’t miss the dining-in. For this, it is vital that the drivers’ networks are well-organized. Businesses can think of various alternatives for fast delivery of food, like hire employees, or can rely on the freelancers, part-time/full-time drivers, choose right transport medium (scooter, bicycle, small track or maybe car), also consider the transport development, road conditions in the particular region as well as climate zone, and last but not the least is fast delivery. The customers require having a streamlined website, easy online food ordering, easy restaurant lists, and simple menu layout. In the case of the restaurant side, they require having order-in management platform, CMS & CRM systems, maximum process automation, and minimum human interference. Then comes the Drivers’ side. Here, they require having access to a list of orders & required external services. UX/UI Design: As the app design comes into the perspective, it needs to be ensured that it is entirely user-friendly and encourages user engagement for the entire above-mentioned user groups. Also, keep the design frame in mind as per the number of platforms you are choosing for your app, whether you want to go for a single platform, or multiple platforms with iOS, Windows & Android. How to create a Food Delivery mobile app? Aggregator Application: Here the app basically does the job of connecting restaurants & their customers, where the app can be considered as a marketplace, where the restaurants are offering their services, while the customers choose & pay. The restaurants are responsible for the food delivery themselves using the service they are most comfortable with. App with delivery service: Here, apart from the restaurants and the customers, there is a third user group of the app, i.e. Delivery service providers. Here, the app is taking care of food delivery, hence restaurants don’t need maintaining their own delivery personnel. Here, the deliveries are arranged within the app via on-demand delivery service providers, who are also having the same app. By now you must have understood that the main difference between the two types here, is in the first one-two group of users are there: Restaurants & Customers, whereas in the second one there is one added group of food delivery service providers. So, in a second you need building one added interface for drivers and arrange for delivery service. 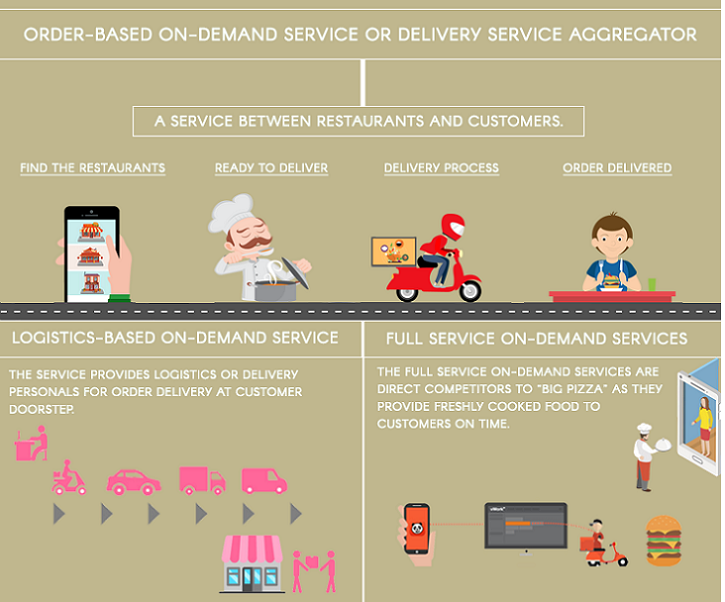 The food delivery mobile app consists of two or three user panels depending on your app type. Registration: Be it food customers, a restaurant, or a driver, whoever wishes to participate in the app, it is vital for them to register in the app and make profiles. Here the registration is done by using the email ID, phone number or via social networking. This app panel is used and managed by the restaurants that are participating in your service. Here it takes care of everything from posting the menus to accepting orders, processing payments, and food delivery. Loyalty Programs: Restaurants need to run several schemes to ensure that the customers to return back to their restaurant, and for the same, they can offer loyalty programs as well. Here, the program stores order history, amount paid by each customer, orders frequency, tying all statistics to customer’ profiles. Accordingly, the rewards are distributed to the customers in the form of discounts, bonus points, etc. Multiple Payment Integration: Integrate the app with a secure and transparent payment integration system that includes everything from the prominent debit and credit cards, and payment systems like Stripe or PayPal. For full customer satisfaction and smooth service, you can include a delay mechanism, unlock payment to a restaurant only once the food order is delivered & confirmed by customer. Manage Content: The CMS (content management system) allow adding and editing the entire content that is related to restaurant’s business, consisting of the restaurant menus, specialties, contact details, promotions, prices, etc. Ensure that the app also supports the image upload feature as this allows restaurants to add pictures of their food and cuisine. Admin Panel: This tends to be the most complex panel, as it is responsible for a lot of aspects – taking food orders from customers, communicating with the delivery team, menus, and estimations of food preparation time. Admin Panel is for the dispatcher who has to keep this whole process together, and hence it has to be easy, intuitive, provide real-time information and be configurable. Admin must be able to view incoming food orders, set time estimate for food preparation, update order status and make alternations on the go if required. GPS Navigation: This functionality is extremely useful in many ways like it helps delivery guys to get right directions and judge distance from their current location to both pickup & drop-off locations. This way it gets easier for them to decide whether to accept an order and know the estimated delivery time. Then, it enables the customers to track delivery in the real-time. And last but not least, it also shows the nearby drivers and this probably can be helpful with delivery, if an emergency arises. Order Management: It is vital that the delivery executive is given all the required information to deliver the order, such as size, contact number, customer address, pickup location, etc. Additionally, they are required to update order status as well – accept or reject, show order as it is in progress/picked-up/on the way/delivered. Search: This is an essential feature in the customer panel, as this way the customers would be able to find their favorite food item or cuisine they are keen to eat. Try including filter system by – name of Dish, Restaurant Name or Location, Cuisine Type, Ingredients, Price, and Dietary specifics. This way, it gets easier to ensure that the users can successfully find what they’re looking for. Order Tracking: This functionality serves as a counterpart of GPS navigation mentioned in the delivery panel. This allows the customers to track their food orders on a map and thus they can well plan their further activities, instead of waiting for their orders for hours without being able to leave for even a few minutes. However, now the customers can easily see their food moves on the map and manage the time accordingly and easily. Payment Options: Same as on restaurant platform, here as well, the multiple payment modes integration allows the customers to make a choice between credit cards & payment systems. Social Share: This feature is certainly an all-time favorite of the customers as it allows them to share their experience instantly with their family and friends, via their social media accounts. Now keep in mind that it also paves a way for viral marketing, as the customers are not just sharing their experience, but in a way are promoting the restaurants and the entire service as well. Order History: This feature allows customers to have a look at their previous orders. This way they can easily remember what they liked earlier or didn’t like any, follow price dynamics, and in case they are participating in any loyalty program running, then they can reconcile the bonus points earned. Rate the drivers: Apart from rating the restaurants and services, customers also like to rate the drivers. Like, in case the driver has received negative reviews and ratings for being rude, late, or for damaging an order, then they don’t get any further orders for delivery. Ratings & Reviews: This is the most loved feature of customers as whenever they are in the mood to try out something new, they look for the reviews. They like to see what others are saying about a specific dish or they can read reviews on service quality. Often customers also like providing feedback on their experience with a restaurant or service as a whole, thus this features proves essential. Now that we have explored the essential features and functionalities for a food delivery mobile app, it is now time to discuss the cost to create an app. How much does it cost to create a Food Delivery Mobile App? 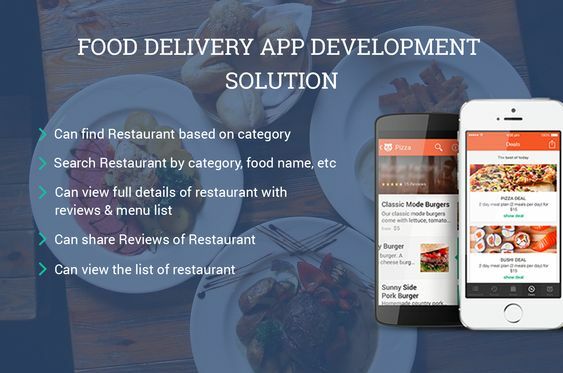 In case you are keen to create a food delivery app for your business in Singapore, then you would first want to know about the whole cost of the app development process. Now there are several factors on which the cost of creating a Food Delivery Mobile app depends on. It is vital to choose the right technology prior to beginning with the development work. Now as per the budget, features, and platform (or platforms) it can vary from PHP to ruby. Other factors are whether you are going for Android or iOS, hybrid apps, native apps, using third-party integrations like app clones, SDKs and APIs. No matter what choice you make, it will certainly affect the cost as well as the effort required for the app creation. Another crucial part of technical aspects is the UX and UI of a mobile app. One aims at making it smooth, fast and flawless, integrating payment modes, order selection, and menu processing. Also, it is best to give a personalized experience to the users as it encourages the users to enhance app engagement and keep visiting it in the future as well for food ordering. All of these technical aspects do impact the cost of the app. Ultimately, it would be the features that you provided within your app would set you apart from the rest. There are several features that a food delivery app can be integrated with such as In-built Tracker, Geo Location, Push Notifications, Search button, social media logins, and many more. These features are essential to make your app likable by the users and user-friendly. Now the cost of the app will certainly depend on the features and functionalities you add to the app. In case you are on a limited budget or unsure of your app’s certainty, you can try going for the MVP model, to begin with. The number of features to include in the app to provide to the users. Are you going for Android or iOS? Keep in mind that Android usually costs less. Are you going for the backend development or are there any third-party app integrations. In the case of backend development, they cost more but are best for long-term, whereas third-party is apt for short budget but in the long-term, it adds up to the huge costs. Will you integrate your app with social media and will there will be an admin panel in your app. The costs to develop a cross-platform mobile app are lower when compared to creating a native mobile app. The team hired by you will take a massive amount of your set budget, so restrain from going overboard while hiring the overqualified personnel. If you desire your app to be visually flattering with a complex design, the higher is going to be the cost. The app will require maintenance post the release as well as the upgrades. If you are planning to develop a basic app with simple and plain UX/UI, simple search and basic functionality for your app, then the cost would be lesser if you choose to go for the mobile app development company. Also, the maintenance costs are also minimal for basic apps. Then for the apps with advanced features and functionalities, social media integration, payment gateway integration, push notifications, navigator, the cost may vary. As per your development budget, you can make a choice. However, the average cost with basic team members such as Project Manager, UX/UI Designer, Android/iOS Developers, Quality Analysis Experts, Backend Developer, the cost in this region would be lesser for app development and it would be 25- 30$/hour with development time ranging around three-four months.